TK - 2nd grade: 8:30 to 10:00 a.m.
3rd - 5th grade: 10:00 to 11:30 a.m.
6th - 8th grade: 11:30 a.m. to 1:00 p.m.
All instruction by RHS Boys Basketball coaches and players. For information and to register: email reedleyhoops@gmail.com or call (559) 978-0869. RHS Culinary Arts is partnering with Valentino's Italian Restaurant for a fundraiser that will celebrate the restaurant's 55th anniversary. 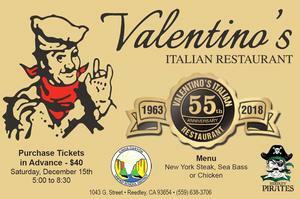 Tickets can be purchased from an RHS Culinary student or at Valentino's Restaurant, 1043 G Street in Reedley. Fee is $50 and is payable on the first day of practice. PUBLIC NOTICE IS HEREBY GIVEN that on Tuesday, October 23, 2018 the Kings Canyon Unified School District Board of Trustees approved Exhibit 9270 - Conflict of Interest Code. The public has 45 days to comment on the policy. To see the full text of the policy and addendum, please select the link above entitled Public Notice. Comments can be made by phone to Dan Gonzalez at (559) 305-7005 or in writing at gonzalez-lu@kcusd.com. All comments will be reviewed at the regularly scheduled board meeting on Monday, November 26, 2018. November 8, 2018 - 1:30 p.m.
8 de noviembre del 2018 - 1:30 p.m.
All staff, parents/guardians and members of the public are invited to attend the District English Learner Advisory Committee meeting. November 8 - 9:30 a.m.
Each person will be required to sign-in. Translators will be provided. Todo personal, padres/guardianes y miembros del público están invitados a asistir la junta DELAC. Noviembre 8, 2018 - 9:30 a.m.
Sera requerido que cada persona se registre. Habra interpretes. Tryouts for girls and boys wrestling and basketball will take place on Monday, November 5 for students in grades 6 - 8 at Dunlap, Grant, Navelencia, Riverview, Silas Bartsch and T.L. Reed. Select the link "Middle School Winter Sports Tryouts" for times and locations. Join KCUSD for our District Fair on Tuesday, October 16 from 5:00 to 7:30 p.m. at T.L. Reed School. The event will showcase our outstanding schools, departments and programs. There will be food, games, bounce houses and student groups from throughout the district will perform. Free transportation will be provided from locations in Reedley and Orange Cove. See link for routes and times. We hope to see you at the KCUSD Fair! KCUSD Test Scores Recognized by CA Dept. of Ed. Continued improvement on state scores, prompts recognition of Kings Canyon Unified School District in California Department of Education press release. Select link for full story. NOTICE IS HEREBY GIVEN that on September 25, 2018, at 7:15 p.m., or as soon thereafter as practicable, at a regularly scheduled public meeting of the Board of Trustees of the Kings Canyon Unified School District (“Board”), which will be held at the Educational Support Center at 1801 10th Street, Reedley, CA 93654, the Board will consider entering into solar power purchase agreements for the installation of photovoltaic systems at eleven District sites, including Reedley High School, and an energy storage agreement for Reedley High School. At said meeting, the Board will hold a public hearing on and consider a resolution to adopt findings required by Government Code section 4217.12 regarding anticipated energy cost savings and other benefits the District may receive if the Board decides to enter into the power purchase agreements and energy storage agreement. The resolution, agreements and supporting documents will be included with the Board’s regular public agenda for the September 25, 2018, meeting.